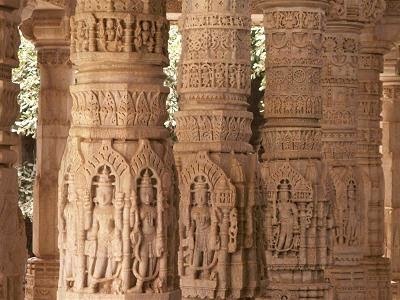 India is a land of monuments of architectural beauty spread all over the country. Mostly they date back to last few centuries, if not earlier. But I did not know that a new one has come up in Delhi! I am sure that most of the international readers of this blog may not have heard about it and fellow nationals might not be knowing about it fully well either. Pardon me if you have already but I was caught unawares during our recent trip to north India. 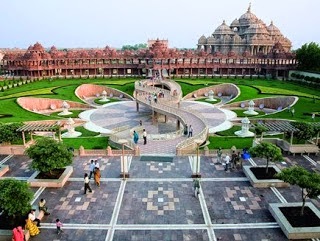 It is Akshardham temple! Simply amazing!! An architectural splendour showcasing 100% Indian tradition and culture ! Another marvel carved out of sandstone and marble,on the banks of the river Yamuna. If any visitor finds it as beautiful as the Taj Mahal or more interesting I would not be surprised. Most of the known monuments in and around Delhi/Agra have some thing in common - the architectural elevations and designs are not indigenous and understandably so.From early 12th century onward till India got independence in 1947 , rulers came from abroad. Dynasties of Mamluk,Khilji,Tughlaq,Lodi,Mughal are of Turkish,Persian,Afghan or central Asian origin and obviously have been influenced by their background in selection of architects and architecture of monuments built in their time. British were busy taking Indian resources to their country and never bothered to have monuments!! But one will find Akshardham structure totally indigenous. The temple-if one can call it so- showcases the gist Indian architecture at its grandeur.This was the first impression which ushered to my mind within an hour after I entered the sprawling complex of 100 acres right in the city which can be accessed even by a metro. 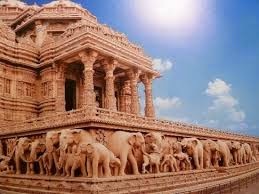 Constructed with pink sandstone and white marble, the temple has hundreds of ornate pillars and lot of domes. With several floral motifs,arches,pavilions,pinnacles all carved out in minute details the complex is simply marvelous compared to any monument of international repute anywhere in the world.Unlike other Hindu temples in India, this complex is open to all irrespective of one's religion, cast or creed,nationality,gender or beliefs which is commendable. I have seen only christian centres like this. However holy it is - Jerusalem or Vatican included- it is free to access for all world wide. 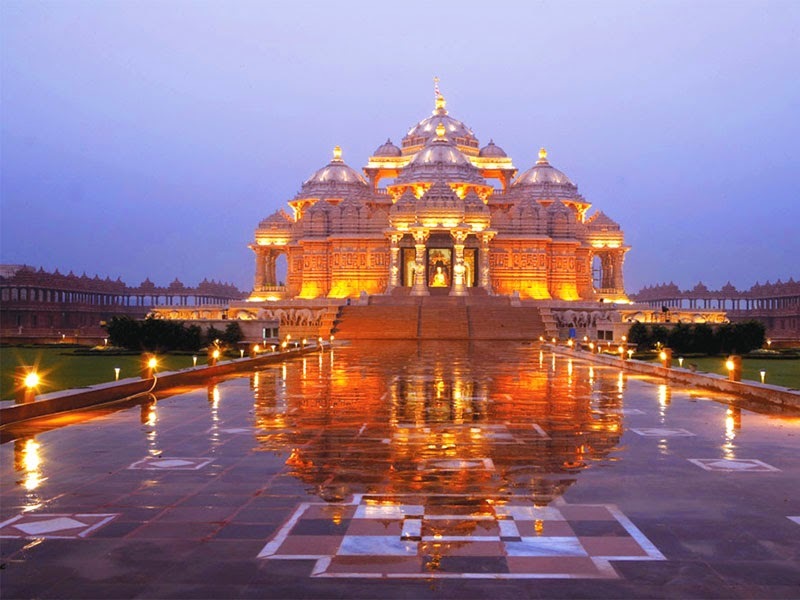 At Akshardham there is no entrance fees! But the security check reminded of those in any international airport.Perhaps even tougher since no camera,video,mobile or even a pen drive is permitted to be taken inside even after security. They have a reason. A temple under the same management at Gandhinagar, Gujarat had an terror attack in 2002. It's design is based on ancient Indian science of architecture and construction(Vastu) and no steel is used for reinforcement of this massive structure for foundations,pillars(columns) or roofs - something incredible for a person like me who has an engineering background! The complex is full of intricately carved sculptures and statues. The complex dedicated to the 18th century sage Swami Narayan has most modern amenities like IMAX theater, excellent library, musical fountains- water show and well laid out garden. Enjoying the marvelously sculptured internal columns,walls and ceilings with soft piped bhajans flowing to the ears could be a rare experience any where in the world.The noticeable difference I could make out compared to other monuments in and around Delhi is that it is clean and well maintained in spite of large number of visitors.The complex belongs to private owners and not controlled by Govt officials could be the reason. Here I have to mention about the food court as well.The hall is designed to give the feel of Ajanta/Ellora caves, another ancient wonder of India . Quality and tasty Indian vegetarian food-no onion, no garlic- from all over India at reasonable prices are served to visitors in hygienic environments- a rarity in tourist places in India.An exclusive 'egg free' pastry shop also is available catering non Indian desserts and the like, the only place in the whole complex where anything from overseas has influenced,I think! Having been inaugurated in 2005, the complex is getting popular among national and international visitors, although I did not know much about it. 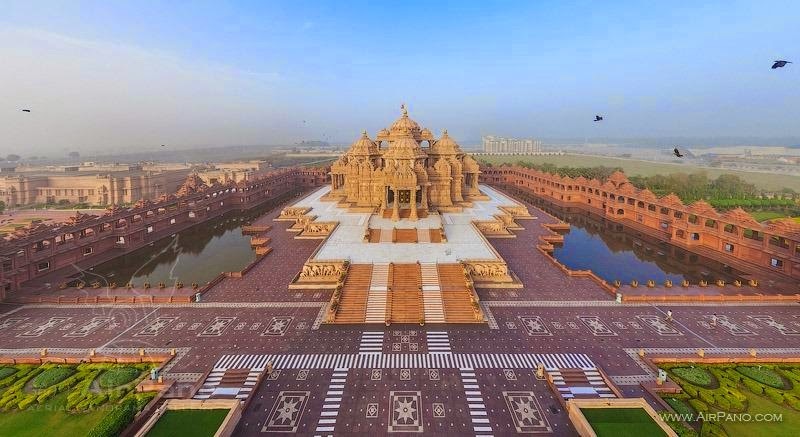 Guinness of World Records has already listed this complex as the 'world's largest comprehensive Hindu temple'. It is not a traditional Hindu temple but more of a 'spiritual theme park' well done, palpable to any visitor . It is just a matter of time that this will be another modern wonder of the world !It can be summed up in one word- a masterpiece !! Photographs are clicked by me or courtesy google.